Again I didn’t manage to post my Yarn Along post to share with all of you in Ginny’s Yarn along on Wednesday. And this is why: I wanted to show you some proper pictures (and not the same old “it’s nearly finished but not yet finally done” pictures) and this meant finishing up things and I only did that last night. I finally finished two important projects: Yesterday I sewed up the Toddler Cardigan, added the i-cord loops the pattern called for and three buttons, washed and blocked it and now it only needs to dry up. The contact with water let it grow enormously but I hope it will shrink a little while drying and then little kids grow loads in a small amount of time, don’t they… And my oh so hated (but great looking) long term project is finally done: the Christmas Sweater. I hope it will fit the recipient! All is sewed up. Remind me to only knit in the round with top down or bottom up raglan sleeves in the future. I hate sewing knitted things. I now remember why when I still lived at home with my parents my mum and me we always waited for my grandma to come over and finish things for us. She is the perfect seamstress. Her sweater seams or anything else that was better sewed by hand always looked perfect. But now that my grandma is not the youngest anymore and I don’t see her that often, I have to do the sewing myself. Having finished so much also meant that this morning before work I cleaned out my project bags and refilled them. From left to right the new (and an old) kids on the block are: The fluffy white thing is going to be a tiny white angora top. When I was home for Easter I got most of the wool from my mum’s stash. Amongst many other things there were 2.5 skeins of white angora wool (I think I remember some of these mix and match sweaters from the early 80s where these skeins might come from). Back in April I thought why not try to do a top down top with this, started and stopped soon enough for the sheer fuzzyness of knitting this (white hair literally everywhere after only one row and who wants to run around looking like you literally plucked the hair from the poor angora rabbits yourself). I frogged the thing and started something I would actually wear. Now we got the theme for our work christmas party and it is “fairy tale” and I want to make a new costume. Now you might remember and say: wait a minute didn’t you make a princess costume for carnival? Yes, I did. But for a christmas party it seems a little over the top. Now what do I do, I decide to do a simple, pattern free topdown angora sweater after all and combine it with a still to be made long skirt and some icy make up to become the snow queen. Keep your fingers crossed for me that the top will get to a decent length with the little wool I have. Then obviously there is the third Phoebe sweater that I’m half way through the body with. My plan was to have it finished by end of November which I won’t make but then I didn’t plan to knit a cowl, a shawl and a hat in-between either. 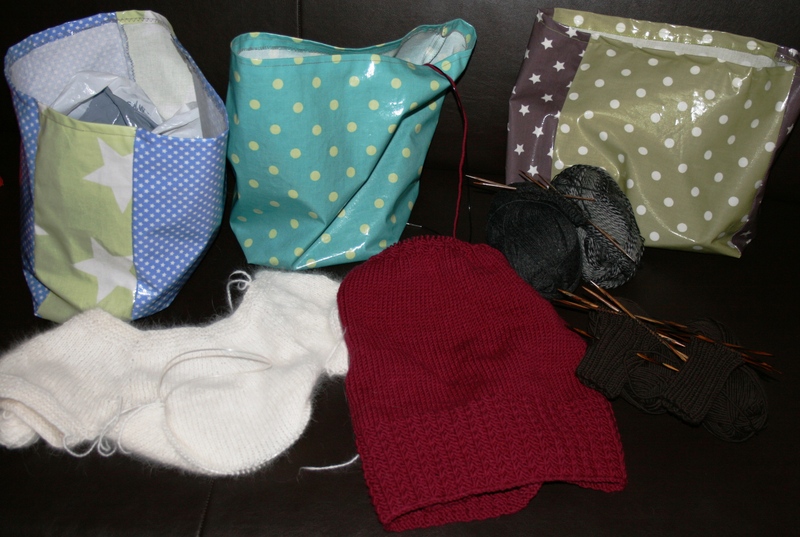 Next I started gloves for Michael and want to knit them parallely to not get a second glove syndrom here. I chose a mitten pattern and will add fingers to it. And in the back I have some sock yarn that might be turned into Pucker Socks eventually. Lots of finished up old things, lots of new things and always lots to do. This is how I like it! 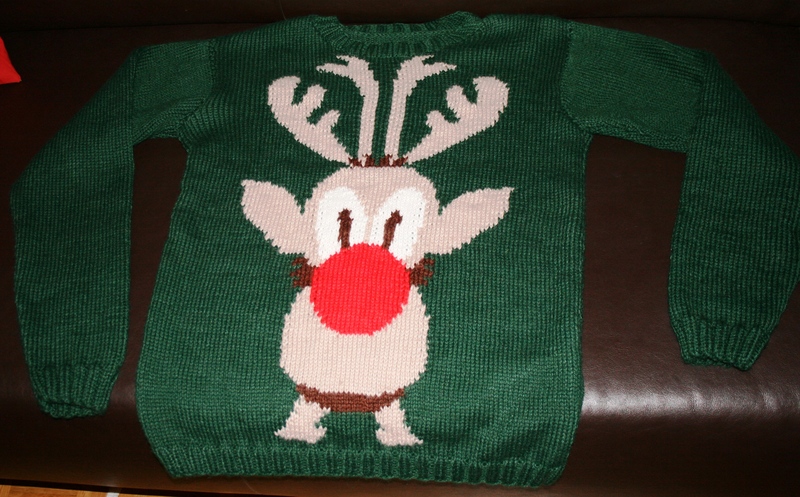 This entry was posted in Knitting & Crocheting and tagged Cardigan, Knitting, Sweater, Top, Yarn Along by kathatravelling. Bookmark the permalink.